Here's one I had completely forgotten I had in one of my long boxes. When Batmania hit in 1966, many publishers were unprepared for the sudden appeal of Super Heroes. I've talked a bit in the past about some of these efforts, such as Jigsaw (by Harvey), Nemesis (by ACG) and Pureheart the Powerful (by Archie). 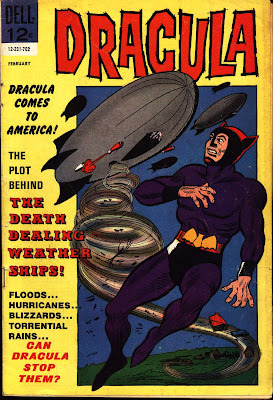 Dell Comics, while no longer the major player in the comics biz that they had been in the 1950s, obviously felt the need as well, and thus we had the brief and rather strange incarnation of Dracula as a superhero. Well, he is the original "Bat-Man". He guides the ship to safety, but is curious as to what caused the sudden storm. Comments: A silly story, but the entertainment value is pretty good and the artwork is acceptable if uninspired. One thing Dell did have over Marvel and DC; the story is a full 32 pages long; there are no ads whatsoever inside the book other than the inside back cover and back cover. 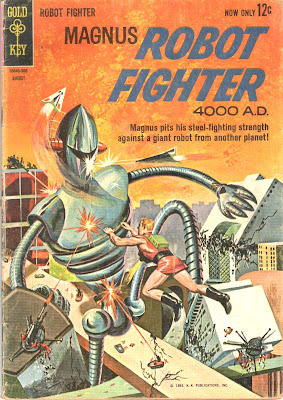 Hat Tip to Silver Age Gold, who posted a few covers from Dell's monster superhero era, for inspiring me to dig out this comic. I trimmed quite a few blogs today; mostly for non-posting, but a few for non-linking. I'm happy to link other comics-related blogs, but I do ask two things: Link to me and let me know you want a link other than the generic "Great blog, I have bookmarked," crap that I see all the time from spammers. I am happy to link to actual comics bloggers, but not to Filipino Brides For Sale, etc. I apologize again for not enabling the followers thing; I would prefer to have it on, but Blogger wants to redo my entire site in order to enable it, and I suspect I would lose the comments on all my old posts. I try to link to everybody that comments, but even there I find that often they have not bothered to link me. So I let it go for 6 months and they still haven't bothered linking. Sorry that's page rank bleed, Google it. This blog has a big page rank and I'm not giving that away to people who can't toss me a reciprocal link. If you're still on my blogroll, don't sweat this. You're posting and you've linked back. That's all I ask. If you're suddenly not seeing my incoming link, ask yourself why and fix it then let me know. I try to be generous with my outgoing links while maintaining the focus on the Silver Age. 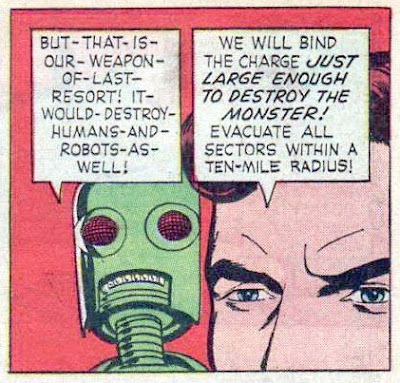 Update: Go check out Silver Age Gold, the first new blog on my blogroll resulting from this post. Aaron's got a good sense of humor and sincerely loves comics from the same era as I do. 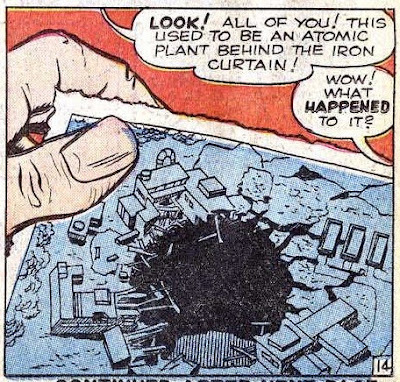 I love his explanation for why he blogs about the Silver Age; it mirrors my thoughts exactly! Update II: The former Fortress Keeper has started a new blog, called The Time Bullet. It's definitely worth checking regularly. 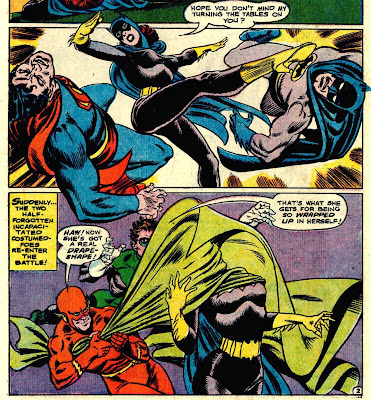 I love his post on Batman's memorable first punch. "A fitting end for his kind!" 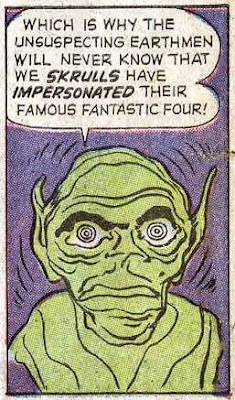 One thing doesn't make sense here--well, okay, more than one thing--what happened to the fourth Skrull? I looked in the letters columns of the next few issues and didn't see any other mention of it. 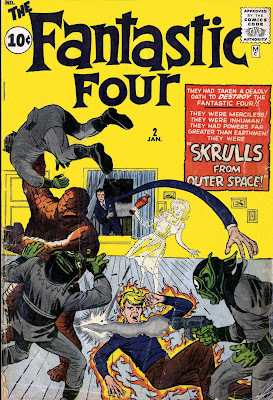 At one point in the story, Reed says that the fourth Skrull was on the mother ship, but that doesn't compute either, as on page 17 we hear that the FF defeated four Skrulls at Reed's apartment, and the entire FF goes up to the ship; wouldn't the commander notice that's five beings returning when only four went down? 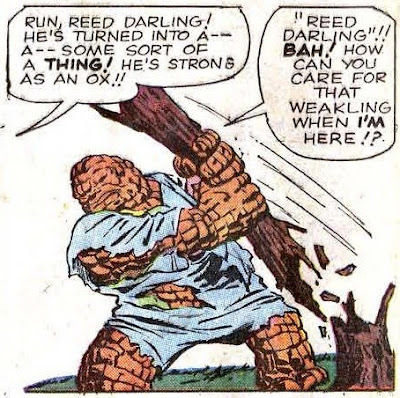 Another note: In a subplot, the FF goes through the cosmic rays again on the return to Earth, and it results in the Thing reverting briefly into Ben Grimm again. 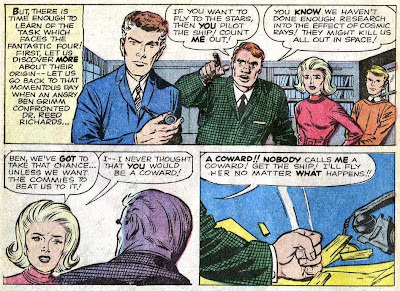 Jacque at Sequential Romance scores an interview with Irene Vartanoff, one of the most prolific DC letter writers of the Silver Age, who went on to have a career in writing including comics and romance graphic (and non-graphic) novels. Irene's own homepage is here. 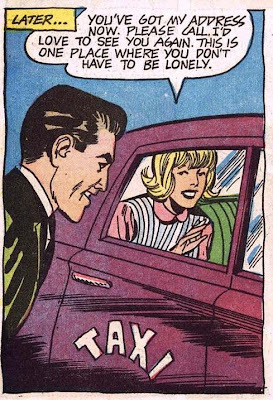 As a 1960s DC comic fan, I occasionally fantasized about writing great letters like Irene, but as it was I did not develop my writing skills until my college years. At some point, I should do some features on the great letter writers of that era, many of whom went on to have careers in the field. 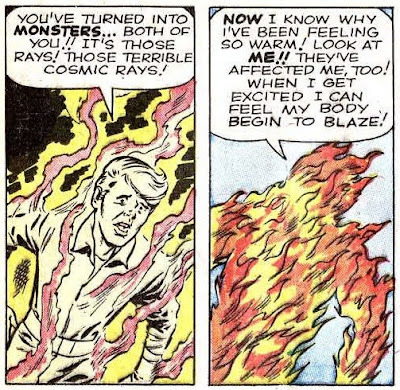 It's all part of the milieu, although I freely acknowledge that I've started my post on Alter Ego and Jerry Bails and Roy Thomas about five times and always felt like I couldn't do the topic justice. Joker tries to roll the Giant Penny (not THE Giant Prop Penny, but a completely different one) to smash the door to the cashier’s office. But Batman was disguised as the Santa on the Giant Christmas Holly pie and rolls the Giant Pumpkin to deflect the Giant Penny. I am sorry to see that the Absorbascon has joined the list of blogs calling it quits in 2009; Scipio always had interesting things to say. Ol' Groove remembers the Demon Hunter, one of the short-lived comics from Atlas-Seaboard in the 1970s. 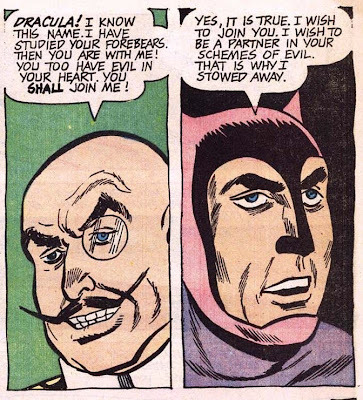 I actually have that issue, and always felt it was one of the best values in the history of comics per actual drawing. The second page of that issue has an incredible 27 panels. Hube at Comics of Rhodey has a nice tribute to the late George Tuska. One of the sad things about doing a nostalgia blog like this is that there's an awful lot of the creators we talk about who are passing away. Karl at The House of Cobwebs talks about the time he scored a nice batch of Charlton Horror from the 1970s. Some very nice and horrific covers on that trove, Karl! 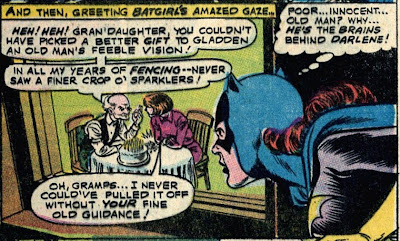 Christine at the Other Murdock Papers has a long, and amusing discussion of Daredevil #30-32 featuring the "Blind Daredevil". Wait a minute, wasn't DD always blind? Yeah, but not in the way he was in those issues. Recommended! Hmmm, hadn't noticed it before, but Magnus is wearing, well, kind of a dress, isn't he? 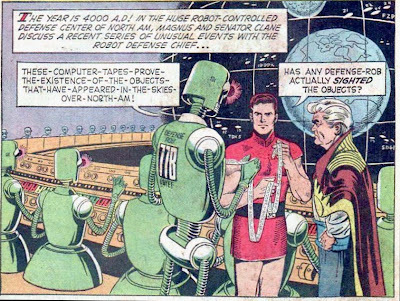 Of course, the computer "tape" is a bit of a failure of imagination; I do remember tape like that back in the early 1970s, so maybe I shouldn't criticize Magnus' attire, since it is stretching the envelope a bit. Comments: The art saves this otherwise pedestrian story. 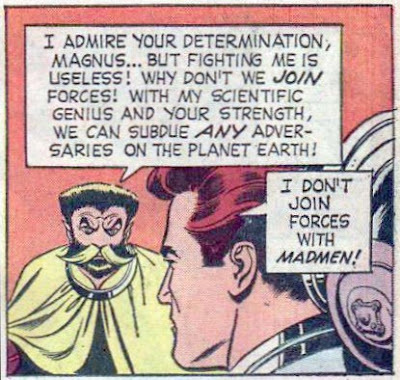 I'm hoping that we get some more characterization for Magnus, particularly an origin story. At this point, we haven't seen Magnus' mentor, Robot 1A, since the opening scenes of Magnus #1. I still like the series a lot; I'm just looking for a little more depth. 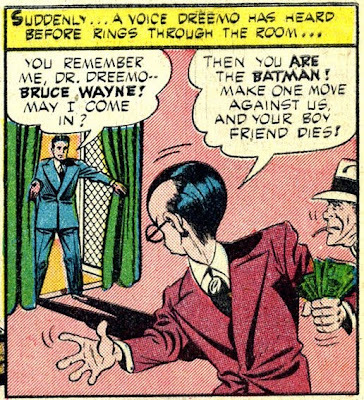 As far as I know, that's the first time that the dual crime-fighting nature of Batman/Bruce Wayne is mentioned, with Bruce as the carrot and Batman as the stick. 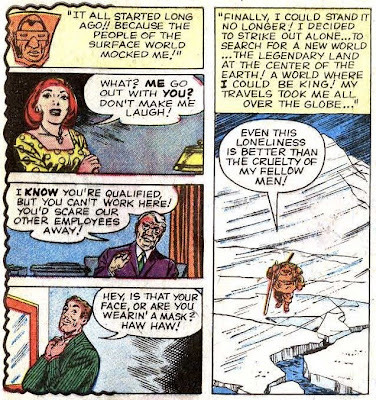 The Scarecrow calls Batman and dares him to attend a meeting in a warehouse to find out why he terrifies villains. 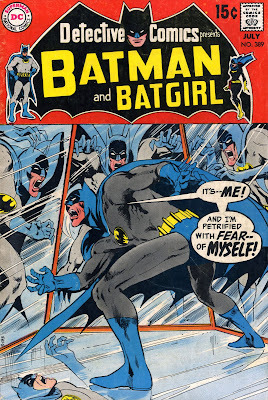 Batman turns up, and when he does, the trap shown on the cover (a ring of mirrors around him) is sprung. 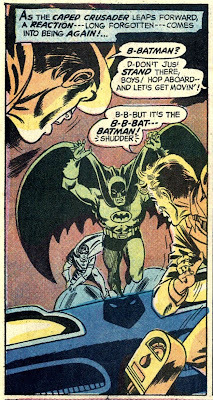 Suddenly Batman is frightened of himself. 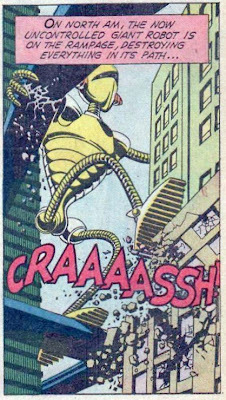 Crane had managed to inject him with a fear-inducing drug. Of course, this doesn't make much sense, as the drug affected nobody but criminals before. 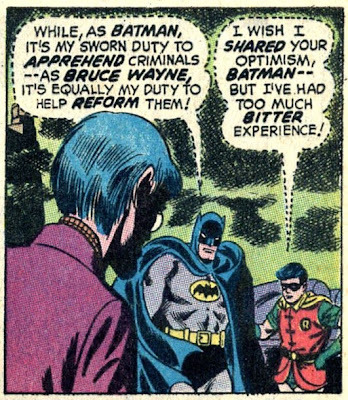 Batman had interacted with Robin, several cops, and Commissioner Gordon in between without frightening them. The Scarecrow warns him that he can only take six exposures to the sight of himself before going insane. 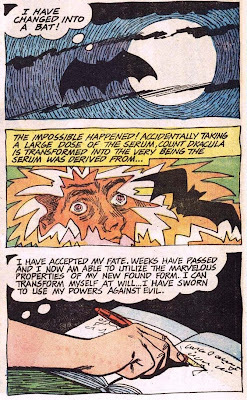 But Batman tricks him into thinking he's used up the six, when in actuality he's only seen himself five times, and so he's able to defeat the Scarecrow and his henchmen. Comments: Way too short a story, although it's entertaining, especially the part where Batman and Robin are reminiscing. 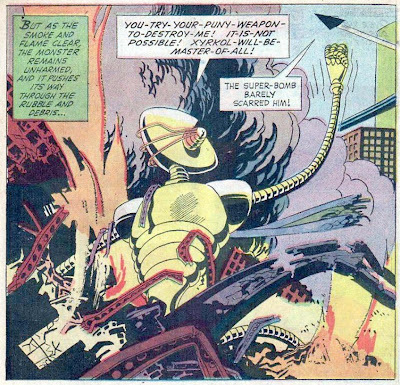 Art by Bob Brown, story by Frank Robbins. 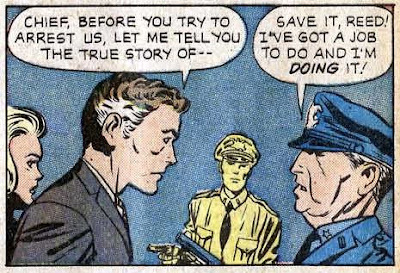 Comments: The story (by Robbins) is nothing special, but the art by Gil Kane and Murphy Anderson is terrific. 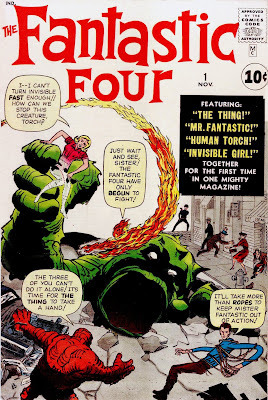 Having worked my way through the 1960s Iron Man, I will now turn my attention to the Fantastic Four issues. Back when I was collecting comics in the late 1960s and early 1970s, I had a friend who was big on the Marvel books, while I collected DC, so whenever we'd discover a cache of the other guy's faves we'd trade. As a result, my collection of Marvels other than Spiderman (the one Marvel series I insisted on keeping) is pretty poor. However, he did let me borrow his FF issues, so I managed to keep reasonably up to date. Fortunately, Marvel recently came out with the complete set of FF issues (plus Silver Surfer) on DVD. These are absolutely gorgeous color scans of the original issues, not black and white like the Essentials series, and not slathered on color like the Masterworks. You can almost smell the musty paper as you read these. Highly recommended as the cheapest way to complete your collection! 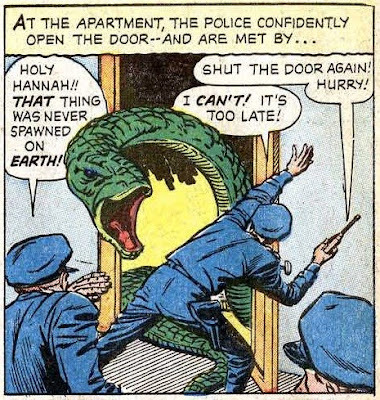 This, to me, is one of the keys to Marvel's extraordinary success in the 1960s. 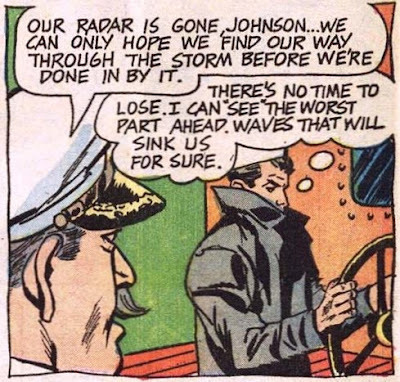 DC's Silver Age characters arrived fully conceived, and seldom changed, while Stan and Jack and the rest of the bullpen were never afraid to tinker with the characters, especially based on feedback from the readers. 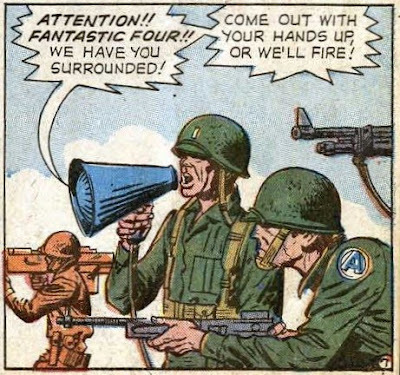 A full listing of all the changes Marvel made during this era would be extremely long, but aside from the above, they added uniforms to the FF, did away with Peter Parker's glasses, changed Iron Man's color from grey to gold to red and gold, changed Ant-Man to Giant Man, changed the look of the Iceman, etc. This is pretty good stuff; the Moleman's given a strong motivation for what he does. He managed to control the creatures below the Earth, and now he's planning an invasion of the surface. But the FF make their way to the surface, and Johnny seals the exit, leaving the Moleman below. Comments: A solid introduction to the series. One oddity is that the story is broken up into several chapters; with a splash page at the beginning of each which is a strong indication that Kirby was doing much of the work putting the story together. 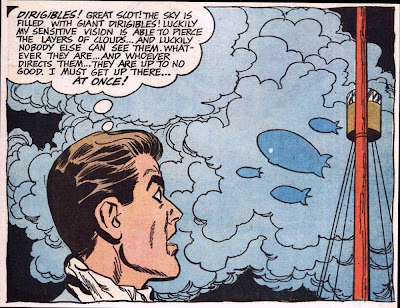 DC often used these chapters in their stories, and Kirby had put them into Challengers of the Unknown, the series he designed for DC in the late 1950s. 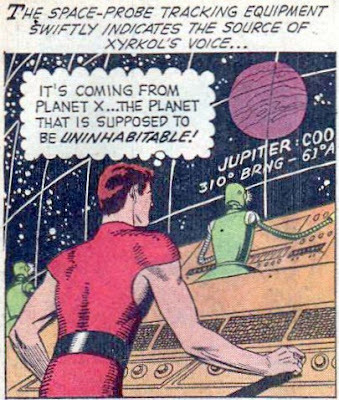 This story starts with Green Lantern visiting Oa, the planet of the Guardians, for a seminar in advanced Green Lanternship. 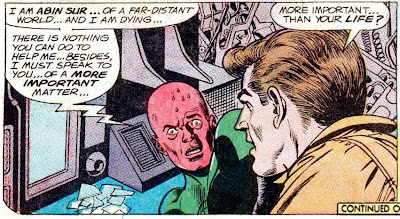 Hal learns that the Guardians have a machine that can read the minds of dead people. 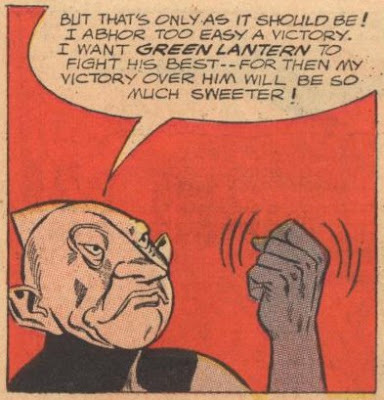 They offer to show him the last thoughts of Abin Sur, the alien Green Lantern who crashed on Earth and offered Hal Jordan the chance to take his place. 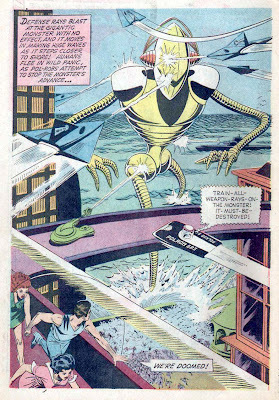 Abin Sur had two requirements for a suitable replacement. The candidate must be honest and he must be utterly without fear. 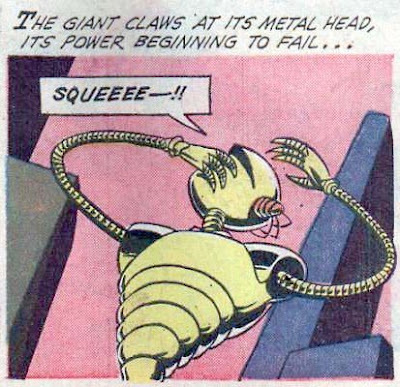 Of course the same type of machine features in two of my favorite Silver Age stories, The Second Life of Batman from Batman #127, and Superman's Other Life, from Superman #132. They both sure like to punch! We found he would have battled pretty much the same crime gallery: Sonar, the Shark, Black Hand, Dr. Polaris, and Sinestro are shown. 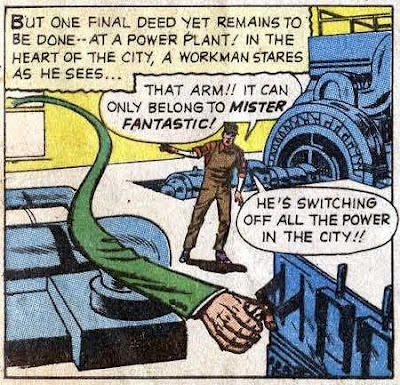 But when the Gardner GL returns to Earth following his initial meeting with the Guardians, he takes a slightly different route, and this is where history starts to diverge. He encounters two robots battling, one orange and the other blue, and learns from them that they come from a planet where the Yellow Plague killed off all the adults, and where the children do not age normally, so they have divided into two warring factions. When Guy first visits the planet he is controlled by the mental powers of the blue faction, but during a battle with the "Orangers" he breaks free and manages to shield his mind from control. 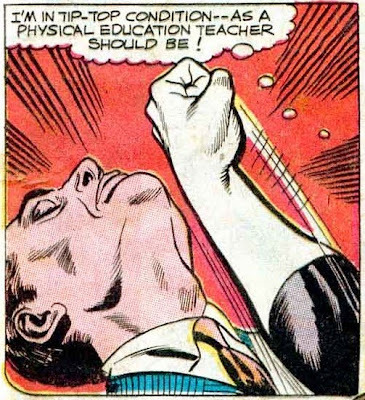 After that, it's a pretty simple matter for the gym teacher to get the kids to behave properly, especially since his ring ensures they will start to mature. 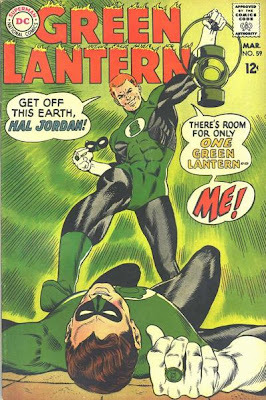 Guy Gardner must summon another worthy individual, who just happens to be Hal Jordan. Again, this perfectly echoes the Batman and Superman tales, both of which ended with Bruce wearing a cowl and Kal in a cape. 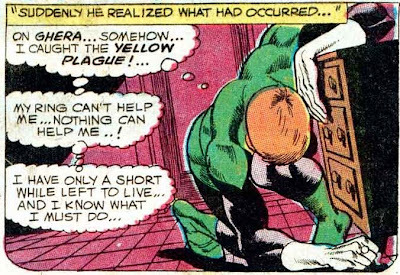 Comments: Cute idea, but it did not get developed in the Silver Age after this; Guy Gardner popped up in a Green Lantern/Green Arrow issue and then basically disappeared until the mid-1970s. But he would become a major character in his own right, with his personality more like the cover of this issue than the ending. For many other "When I'm the Evil Genius" posts click the link. Trivia Quiz #34: What Do They Have In Common?